After 10 years, I decided to replace my 633MHz home server with something more modern. The fans on the system were making a lot of noise, especially the Slot-1 CPU cooler fan, which I don’t think I can find a replacement for. Also, the motherboard was very choosy about the power supply, meaning I could not use the newer, more energy efficient supplies; the voltage monitors claim the voltage is out of the acceptable range and refuses to continue beyond the POST screen. I chose the MicroATX form factor, and the most compact case is the Silverstone SG02F because it places the power supply on top of the board. Most other cases I’ve seen have a similar layout to an ATX tower, but with a height reduction. The wires are long and unwieldy because they assume you are using a normal ATX case, in which case you need relatively long cables depending on how the case is laid out. However when building a SFF machine like this, it gets really untidy. I decided to reduce the length of the cables. 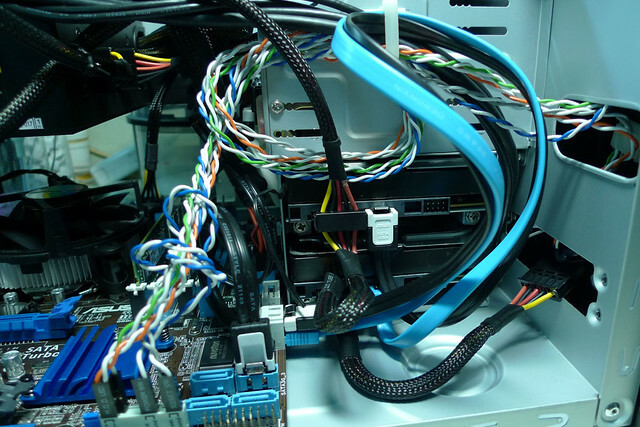 Here’s the before photo of the wiring – the worst offenders are the SATA cables, the case front panel wires, and the SATA power connector. ladyada maintains a wiki page of parts called Partfinder, so I thought I might just use the name because I lack creativity. Hope she doesn’t mind. I bought a couple of the rotary encoders that SparkFun carries through a local online store here called sgbotic.com for S$4.95 and I was wondering whether there were any other similar alternatives. I did a search on my favourite component distributor, now called element14, and it turns out there is a cheaper alternative! So I thought I’d share it here.